Zakopane is an extremely popular and well known mountain and skiing resort situated in Southern Poland, at the foot of the Tatra mountains, the highest mountain range in the country, only a stone's throw from Slovakian border. The town can boast the oldest ski jumping venue in Poland - Wielka Krokiew hill built in 1925. 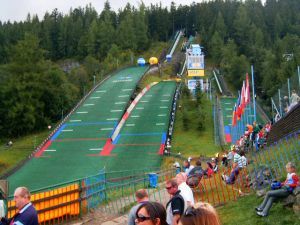 Today, the ski jumping complex consists of five of hills - HS-134, HS-94, HS-72, HS-38, and HS-18. All of those are covered with Everslide plastic, which makes them available all year round. The hills are part of the Sports Centre, a national company providing training and accommodation facilities to national teams of various disciplines. Zakopane Sports Centre includes the following sporting venues - an indoor swimming pool, sports hall, gym, judo, wrestling, weight lifting hall, speed skating rink, cross country tracks, football pitches, tennis courts, and many more. 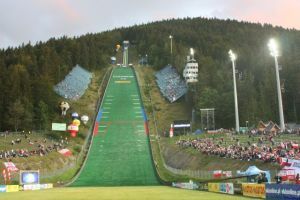 Zakopane has hosted numerous skiing events, such as FIS 1929 and 1939, World Championships in 1962, FIS ski jumping and Nordic combined World Cups, Grand Prix, Continental Cups, FIS Cup events, as well as reschedule Junior World Championships in March of 2008. The area offers excellent opportunities for mountain hiking and climbing. Vicinity of St. Pleso (Slovakia), (80 km) makes it an interesting break for those based on the Polish side of the Tatra mountains, or vice versa. 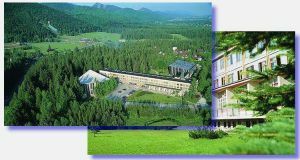 Our first choice of accommodation are the Sports Centre hotels - Zakopane or Imperial, however this is not the first or the most recommended one. Nevertheless, this option offers a possibility of including training fee as well as other sport facilities use in the accommodation price. Being one of the most popular mountain resorts in the country, Zakopane has got some 100.000 beds on offer, available in hotels, pensions, B&B and holiday houses. This results in huge variety as far as accommodation facilities are concerned, ranging from anything as cheap as 20 Euro per person a night FB in a private house, going up to 4 and 5 star hotels fare. Apart from the complex of jumping hills, Sports Centre has also got an indoor swimming pool (recently renovated), sports hall, body building gyms, football pitches, judo, weight lifting and westling halls, small athletics stadium (recently renovated), tennis courts and roller skating tracks. There are 5 km of artificially snowed and lit cross country tracks available at the moment. There is also a brand new outdoor and artificially cooled speed skating track, where Junior World Championships were held the last winter season. In the neighbouring village of Kościelisko-Kiry (5 km), there is another complex of cross country tracks with a stadium and a biathlon shooting range, where both European and Junior World Championships were held in the past.